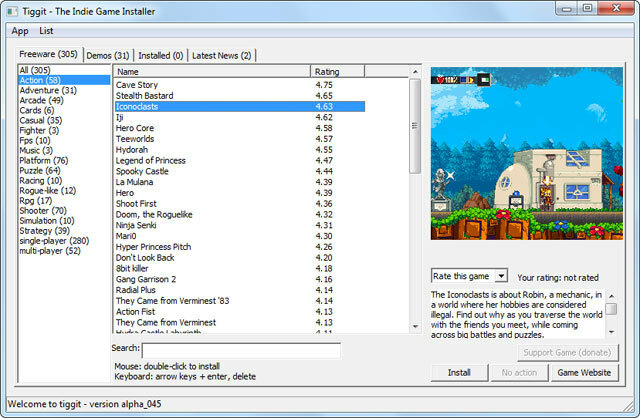 Tiggit Download With Tiggit 1.0 we present a free indies repository for pc,with which we can access totally free and very orderly about 300 different games.It's a great program to free pc games download. You will access open source games with simple but fun graphics and appearance and most importantly to play completely free with your pc. You will have the games classified by categories, action, adventures, fights, puzzles, strategy and many more categories to enjoy this free program for pc. Each game has a score, rating that has been given by other people who have already played it, this will help you choose from the great variety offered by Tiggit 1.0 in its menu. You can also rate games for others to benefit from your score. You can also access a whole community of Tiggit 1.0 players with forums and news.